Location: 100 metres NE of Beevor's Shaft, a few metres to the north east of the old bridge. This is a stone lying flush with the grass, with a very eroded inscription carved over two lines which in the photograph has been picked out with peat. The stone is probably associated with the south-east corner of the lease held by J. Clayton & Co marked on the Brailsford 1781 survey. Interestingly, the stone also marks the north-west corner of a meer held by T. Clayton. 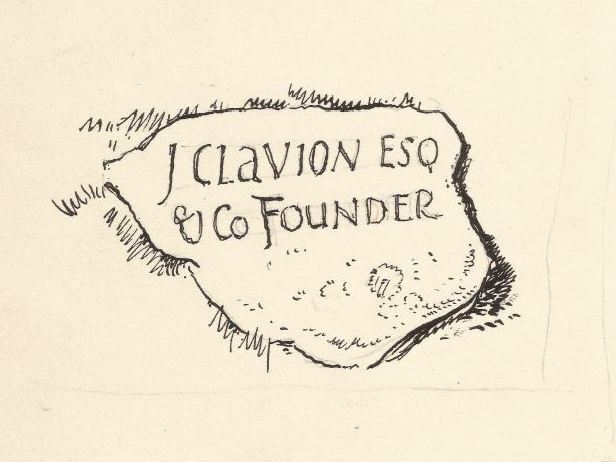 A drawing of the inscription appears in Arthur Raistrick's paper The Founder Meer in the NCMRS 1962-1963 Transactions (see references). This drawing was done by either Marmaduke Miller or Dan Binns, and was provided by Robin Miller via Chris Camm. A version of this page with a photograph of the stone may be found here.